The days went by like a blur. 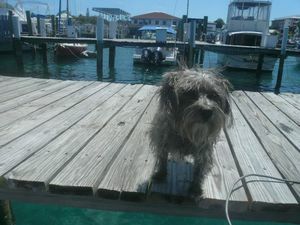 Kris and I explored downtown Nassau by foot on Tuesday while Gary and Spinny relaxed on the boat. There are many interesting old buildings in town, and numerous restaurants, gift shops, a pirate museum, straw market, and guided tours of different kinds. Be careful when crossing the street though! The Bahamian drivers can get a little crazy. Even locals will tell you to be especially mindful. And don’t forget that the roads work in opposite directions! Becky, the French Canadian dog. Tuesday night Kris and I went out with a few French Canadian friends we’d met on the dock. 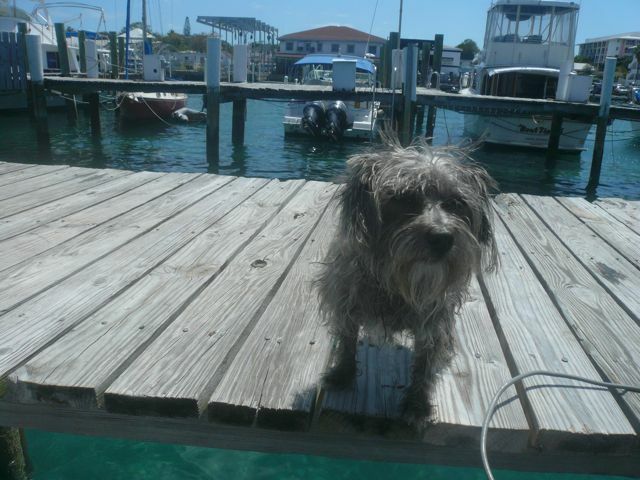 They work for Navitours charter company, which keeps it’s 10 boats in Nassau Yacht Haven. It was Kevin’s birthday the next day and we went to Senior Frog’s to celebrate. The night was spent watching drunk cruise ship passengers bemusedly and eventually wandering off onto the dance floor ourselves. 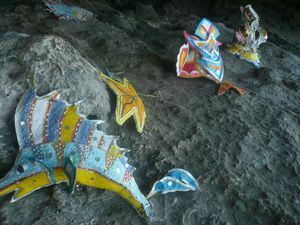 Junkanoo headdresses at the caves. The rest of the week went by in a blur. We rented a car Wednesday in preparation for Carol’s return flight on Thursday. We explored the rest of the island by car both days, finding many resorts, private vacation homes, smaller local homes, a couple of old forts, and several unfinished building projects. We did find a few caves on the north west end of the island. The caves were fun to explore and the little daiquiri stand just outside was delicious! Everything was made with fresh fruit, bananas, strawberries, mangos, even coconuts! Yum. Before we knew it, it was Friday night. At the start of the evening, Kris and I dinged over to Paradise Island to see the aquarium at the Atlantis Resort. More on that visit in the next post. Later in the night, we went to meet our Navitours friends at a local bar just across the street from the marina. Though only one friend showed up and hour later than the meeting time, Kris and I still had a good time. The locals and another boat couple began giving us dance lessons and partnered up to dance with us. We danced to music played by a local band (which included a saw as an instrument). It was a true Bahamian experience. Building in Nassau on the walk to downtown. Tree up the side of a building. The cruise ships pull in. Burnt out building. Just burned a week before we arrived. No one was hurt, as far as we know. The light at the mouth. Are there bats in here? Door of a small fort in Nassau.